High-quality telephoto lenses for DSLRs are tricky to buy. They're a huge investment, with prices starting at around £1,500 and heading sharply skywards. There are also considerable usability problems: long focal lengths require fast shutter speeds, which require large apertures, which all results in lots of heavy, fine-tuned and extremely expensive glass. The Sigma 120-300mm f/2.8 EX DG OS HSM is a cheaper option than Nikon and Canon's astronomically expensive (although superb) pro lenses. We got ours from Warehouse Express, where you can pick one up with a three-year warranty for £2,099 in the UK. 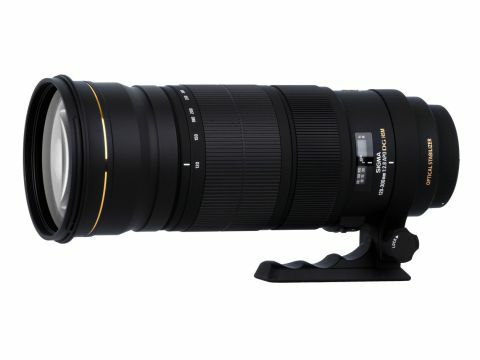 In the US they're priced at around $3,199 - far cheaper than a 300mm f/2.8 lens from Nikon or Canon. But is it any good? The new Sigma 120-300mm f/2.8 EX DG OS HSM replaces Sigma's older, almost-identically specified lens. With the new model you get optical stabilisation (OS), and the whole thing adds up to a lens that is far from a lightweight. It's heavier, for instance, than the Canon 300mm f/2.8 prime lens by nearly 600g, which isn't exactly a welterweight at 2.4kg. The Sigma is twice as heavy as the Canon 100-400mm f/5.6, although in fairness it's also two stops faster at its telephoto end. Can you shoot with the Sigma 120-300mm f/2.8 EX DG OS HSM handheld? Just about, but don't expect to be able to train it on a subject for particularly long - a monopod is important unless you want aching arms. Attach it to a support and it feels well-balanced and easy to manoeuvre.